If a process has been partially completed, but has been abandoned by an applicant, or a review or approval has been denied, you can "Halt" a process to stop it from moving forward, but keep it in the system. When dealing with duplicate, mistakenly launched, or test processes, you may prefer to remove them from the system entirely by Deleting them. Deleting processes will also remove them from your aggregate statistics and data visualizations. 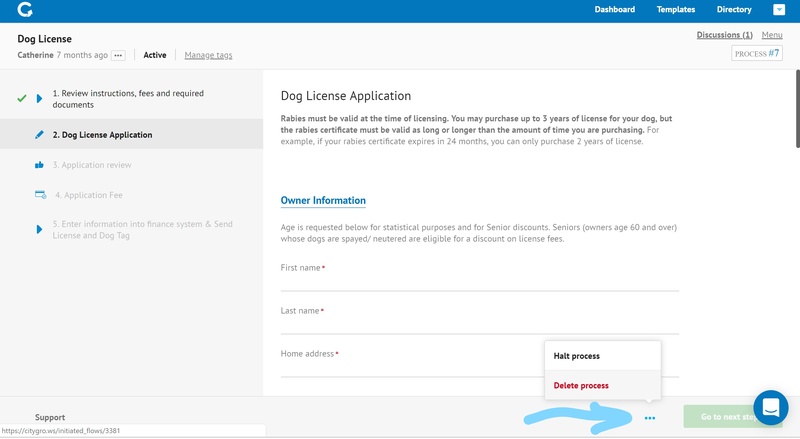 You can delete individual processes by clicking on the 3 dots at the bottom of an individual application (see arrow below) and then selecting "Delete this process." 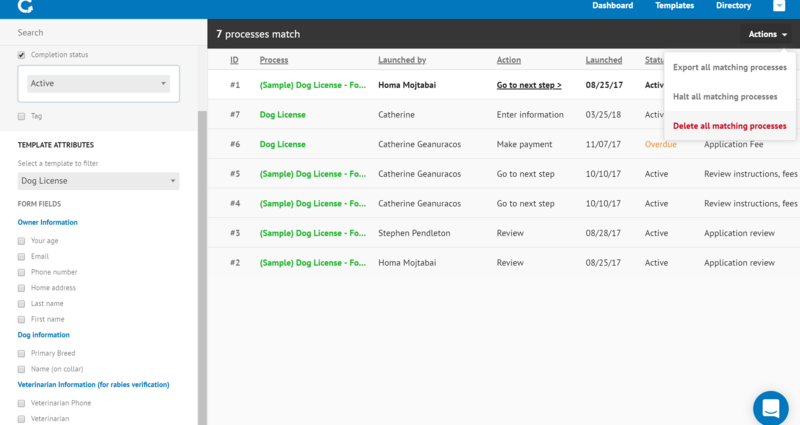 You can also delete one or more processes from your dashboard by searching, sorting, or selecting the processes you want to delete and then choosing "Delete selected processes" from the "Actions" menu on your dashboard. But be careful! Once you delete a process, it's gone for good! That's why we ask you to confirm the number of processes you wish to delete before you delete them. There's no way to recover a deleted process once ti's gone, so if you think there's a chance you might need any of the information in an application in the future, we strongly suggest you Halt rather than Delete.